This holiday season, give toys that teach as well as entertain. Check out our list of top toys for all ages and stages! Looking for that perfect toy for the wee ones on your list this holiday season? We surveyed some local child development specialists as well as “Best Of” toy rankings to find toys and games that help children learn and grow while they’re playing. Why we love it: This toy provides opportunities for imaginative play and developing fine motor skills. It also helps with language concepts such as naming animals, producing animal sounds and matching/naming colors. Why we love it: Shape sorting and stacking games are experts’ favorites for toddlers. Not only do they develop fine motors skills, but color and shape recognition, sorting and problem-solving skills. 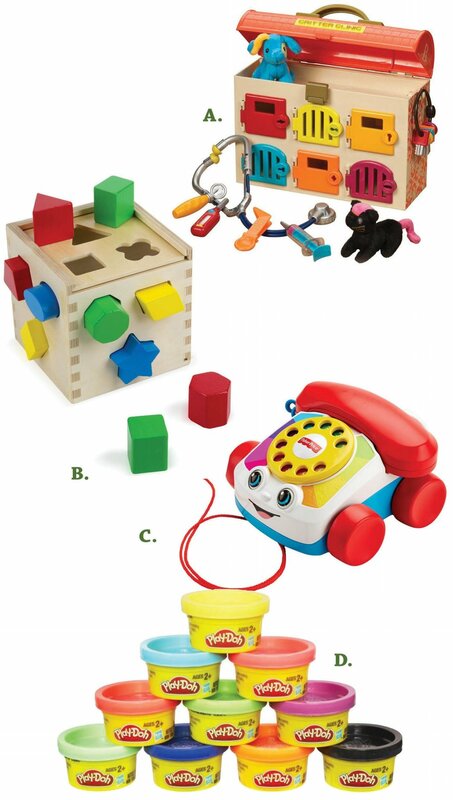 This model offers solid wood construction and bright, non-toxic colored shapes. Why we love it: Few toys get it right like the smiling rotary dial telephone that has entertained generations of youngsters. Pull it along by its string and listen to it chatter and watch the eyes move – Fisher Price has modernized the look a bit, but it’s still captivating fun for toddlers. Why we love it: Drawn from the way-back machine, Play-Doh still ranks very high with educators who love the imagination-inducing nature of the colorful globs of moldable dough. There are plenty of themed kits that you can buy, but all you really need is the starter pack to keep little ones entertained. Why we love it: It’s never too early to learn coding, as this toy attests for preschoolers. By rearranging the sequence of the caterpillar’s segments, kids learn which sequences produce what movement. Why we love it: Designed for preschoolers to develop hand-eye coordination, fine motor skills and creative thinking, the toy allows children to match and snap chunky buttons to complete the pictures. It’s a great toy to stimulate the imagination of your little artist. Why we love it: Old-school games are back in a big way (Did they ever go away?). Kerplunk and its co-horts Battleship, Operation and Connect Four all have stood the test of time for the way they develop strategic thinking and problem solving to fuel your family game night. Why we love it: Remember the game “telephone” you played as a kid? This follows the same premise, except instead of whispering something from one person to the next, each player completes a series of drawings and captions. Artistic ability is not a priority; quick, creative thought is. Why we love it: A 2017 Toy of the Year finalist, this kit provides more than 100 snap-together pieces to build the launcher and then allows for sending the zip flyers up to 30 feet in the air. A great toy for parent-child time, too. Why we love it: Crossword games have been around a long time, but Mobi takes the concept and applies it to mathematics. Players try to arrange their numeric and mathematical symbol tiles into equations. It’s a great game that challenges all ages. Why we love it: This popular series invites budding paleontologists to dig up the fossils hidden in the prehistoric rock. There are several kits to choose from; for slightly older children, look for the T-Rex version. Once the kiddos dig up the bones, they can reconstruct the skeleton. Why we love it: Another throwback game which – like its cousins Ants in the Pants, Lite Brite and Hungry Hungry Hippo – develops fine motor coordination. They’re all as much fun as you remember, too. Why we love it: Based on the New York Times best seller, the game revolves around completing sequences of colored game pieces. Easy enough for a toddler, yet complex enough to challenge teens’ and adults’ decision-making and critical thinking skills, it’s a game they’ll never outgrow. Why we love it: A great STEM starter kit, Snap Circuits allows kids to build their own working circuit with a single switch that turns on an LED or plays a tone. Additional kits allow kids to construct even more elaborate functions such as digital voice recorders, burglar alarms and other electronics.